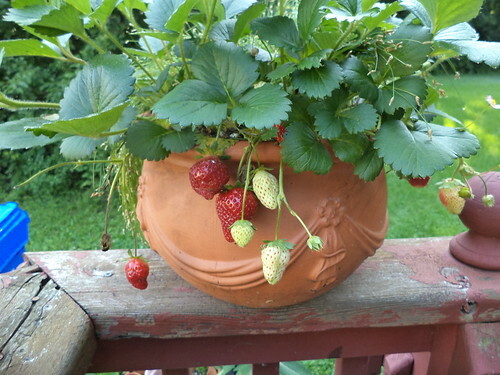 Deb's Cup of Tea: Berries Finally! 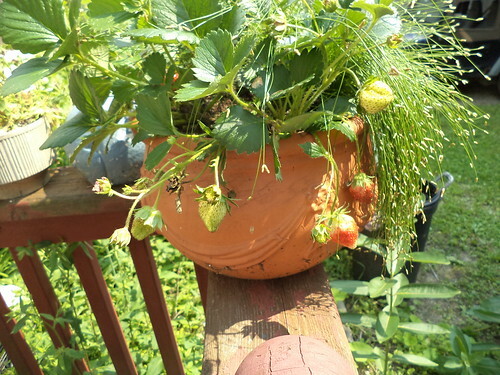 In the rearranging of the deck to bring in the washer I decided to move the pot containing the strawberry plants up onto the deck rail. Look at all those berries. I had little hope that I'd get to enjoy them, given how my plant has been plundered by vermin unknown. I found out the little bugger hasn't been dragging them away to eat, either. 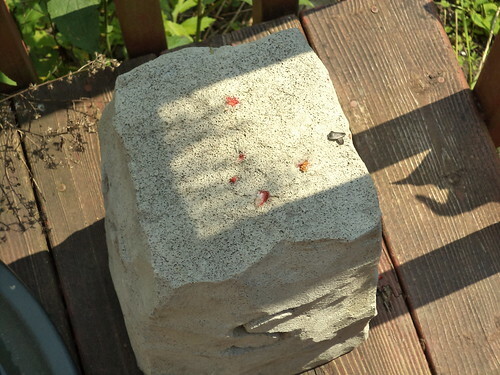 This fake stone is in the corner under the location where I'd moved the pot. This makes me wonder if squirrels really are to blame. Two years ago, I had chipmunks brazenly sunbathe while sitting on this. Maybe they were grabbing my berries. Whoever was doing it, hasn't touched the plant since I moved it up onto the railing. I actually need to harvest the plants this weekend. I'm going to get a handful of berries, finally, to have with breakfast. I'm not sure this is where I want to keep the pot, but perhaps that's all that needed to be done. I simply needed to move it up off the deck floor. The next question is whether to bring this inside this fall. It would not produce fruit since there are no pollinators, but it might be kind of cool to have the plants overwinter inside. Buying from Select Seeds was one of the best things I did this year's growing season. 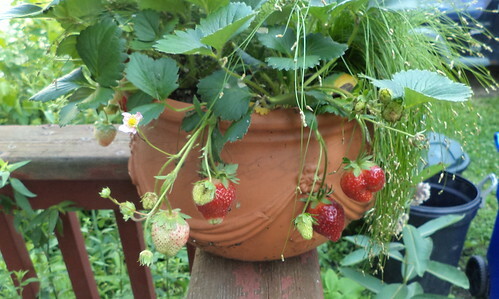 Here's to fresh strawberries from my "garden".